Seven souls risk everything to seek a home on the West Texas frontier. Will they discover a secret Eden, or have they embarked on a dangerous misadventure? Cowboys Luke Stuart and Tom Schurtz meet in the infamous Dodge City at the end of trail drives in 1877. Back in Texas, Luke and his wife, Elizabeth, divulge a plan to Tom. The Stuarts and Tom consequently partner up and venture out to establish an ideal ranch in the canyons region of the Llano Estacado, only recently (and not completely) vacated by the Comanche.They seek the mysterious Canyon Escondido, which may not exist. They have learned of it from the family lore of neighbors and the legends of their peoples, Apache and Mexican. In hope, the pioneers drive their herd across rolling plains, through notorious settlements and the wanton buffalo slaughter. Various challenges test their determination along the path they have chosen, not least so when they finally face the success or failure of their quest and what must then follow. 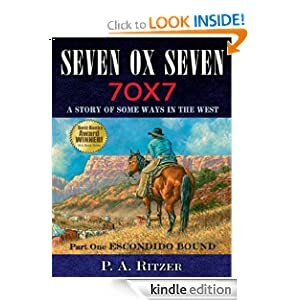 P. A. Ritzer spent four years traveling through Kansas, Colorado, and especially Texas, researching primary and secondary sources, and the land itself and the people who live on it, to inform his crafting of Seven Ox Seven. He brings to his story a background in history (Gonzaga University BA) and theology (Harvard University, University of Notre Dame MA). Also you can get ColorBook for free today only. ColorBook is a photo-editing app for your Android device that lets you turn your own personal pictures into coloring book images. Create colored masterpieces and share them with your family and friends; each image you create will be truly one of a kind. It’s easy to turn a photo into a customized coloring book image. Just open the ColorBook app and take a photo (or choose one from your personal photo gallery or Facebook profile). 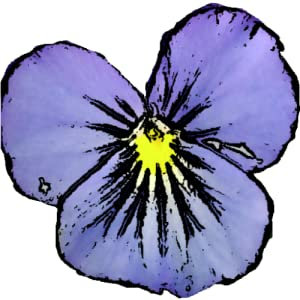 The photo will appear on your screen transformed into a black and white, pencil-drawn image. If you like, you can change the visual style of the image before you go any further. Touch the Menu button, then select Style, and you’ll find three options: ColorBook (the default line-drawing style), GrayScale, and Original. Pick your favorite. Now it’s time to get coloring! Start by choosing a brush size and paint color from the tabs at the bottom of the screen. Create broad strokes with a large brush, or pick one that’s pinpoint-sized to get precise. For detail work, you can use the app’s two-finger zoom feature to see up close and make sure you color inside the lines. The color choices are wide open, so be creative. Basic options are available at a single touch, but you can also bring up a color wheel and choose the exact shade you want. Coloring is easy. Using your finger, touch the screen anywhere. You’ll see the color appear immediately, as if you’re holding a crayon or pen. If you make a mistake, touch the Erase tab and use your finger to remove the offending strokes. When you’ve finished your masterpiece, make sure you share it with your friends. You can post it to Facebook or send it via e-mail or text message. And remember to save your work to your device! You can make sure you never lose a project by selecting “Auto save” in the app’s Menu settings. Then anything you’re working will automatically be preserved for you whenever you exit the app. Happy coloring! This entry was posted in Kindle Applications, Kindle Apps, Kindle Books, Kindle Daily Deal and tagged ColorBook, P. A. Ritzer, Seven Ox Seven by Paul. Bookmark the permalink.